SÃO PAULO, BRAZIL – Sales of cars, light vehicles and trucks grew 20.8 percent in March, compared to February, according to figures revealed by Anfavea, Brazil’s National Association of Vehicle Manufacturers. Although the total is down 5.5 percent on figures for last March, if the first quarter of 2013 is compared to the same period in 2012, there has been an increase of 1.5 percent, Agência Brasil news agency reports. Anfavea says vehicle sales in Brazil can grow between 3.5 and 4.5 percent in 2013 to a record of 3.9 million units, photo by Fabio Rodrigues Pozzebom/ABr. 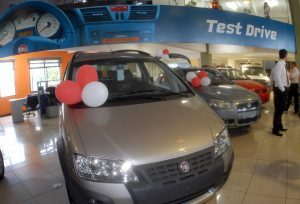 The industry saw vehicle production in March go up 39.2 percent on February, an increase of 3.4 percent on March 2012. In the first quarter of 2013, 12.1 percent more vehicles were produced than in the same period in 2012. February’s production levels were down due to the incremental re-addition of IPI (tax on industrialized products) on cars. However, the government has now extended the period of reduced IPI for the fourth time, to at least December 31, 2013. Motorcycle production dropped 27 percent in March, but 6.6 percent more trucks and 30.9 percent more buses were manufactured in March year-on-year. With the IPI reduction extended to the end of the year, Anfavea now believes vehicle sales can grow between 3.5 and 4.5 percent in 2013 to a record of 3.9 million units, which would otherwise have been unobtainable. The industry had its most successful year to date in 2012, selling 3.8 million units, an increase of 4.65 percent on 2011, which itself had been a record year. Nearly 152,000 people in Brazil were employed by the vehicle sector (which includes those who make agricultural machinery) in March, Folha de S.Paulo reports.